A Saudi-led airstrike killed dozens of Yemeni children. Could the world have stopped it? The pictures show bloodied children crawling on a road in Yemen. More lie motionless in the dirt and dust behind them. In video from a local hospital, doctors receive dozens of bodies wrapped in white sheets. Those lucky enough to have survived the airstrike are treated for their injuries. Some of the small figures are still wearing their backpacks. The images show the aftermath of a U.S.-backed, Saudi-led coalition airstrike in northern Yemen on Thursday. It left more than 50 people dead — mostly children traveling on a bus coming home from summer camp, according to the U.N.
News of the bombing reverberated around the world, and focused attention on the three-year war. It also raised the question: In the midst of the world's worst humanitarian crisis, what can be done to protect Yemen's most vulnerable? The calls for action were almost immediate. The U.N. said Friday that it believed the airstrike was the "single worst attack since 2015." “How many more children will suffer or die before those who can act, do by putting a stop to this scourge?" asked Henrietta Fore, the executive director of UNICEF, the U.N.'s children's fund. According to the agency, some 2,400 children have been killed and 3,600 maimed in the country since the conflict between the pro-Government forces and Houthi rebels escalated in 2015. Around 1.8 million Yemeni children are at risk of diarrhea diseases and 1.3 million are at risk of pneumonia. The Saudi-led coalition — whose members get Western political backing and buy billions of dollars worth of arms from the United States, Britain and France — has waged a campaign against Yemen's Houthi rebels since early 2015. The coalition is fighting to counter the influence of arch-foe Iran, an ally of the Houthis. 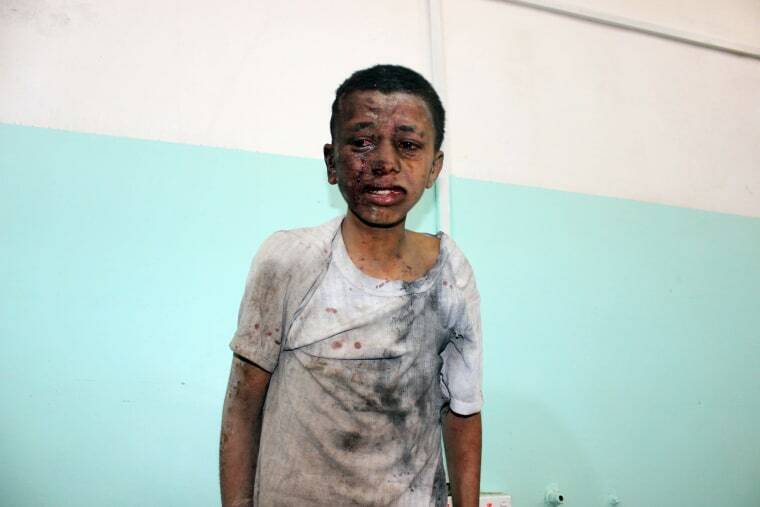 Michael Stephens, a Middle East expert at London think tank the Royal United Services Institute, stated the obvious: If children are to be protected in Yemen, the coalition needs to do a better job of identifying targets. “When you’re hitting a school bus there is a big problem with your target acquisition process,” Stephens said, referring to the way armed forces distinguish between military and civilian targets. There are established rules meant to prevent this sort of tragedy from happening, he said. "Politics can mean that you loosen or tighten these rules, but the frameworks are there and they [the coalition] just have to abide by them and that’s up to them," Stephens added. There have also been calls for an investigation into what led to the strike on a busload of children. U.N. Secretary General António Guterres called for an independent probe and said all parties should "respect their obligations under international humanitarian law, in particular the fundamental rules of distinction, proportionality and precautions in attack." State Department spokesperson Heather Nauert called on the Saudi-led coalition to conduct a "thorough and transparent" investigation into the incident. For its part, the Pentagon said the U.S. was not involved in the airstrike in Sa’ada. "The U.S. military support to our partners mitigates noncombatant casualties, by improving coalition processes and procedures, especially regarding compliance with the law of armed conflict and best practices for reducing the risk of civilian casualties," spokesperson Lt. Cdr. Rebecca Rebarich said. Later, the Saudi-led coalition signaled a shift from an earlier stance when a spokesman had defended the attack as a "legitimate military action." "The coalition is firmly committed to investigating all claims regarding mistakes or violations of international law, to sanction those who caused these incidents and to provide assistance to the victims," the Saudi Press Agency reported, citing an unnamed official. It was not clear what this investigation would entail, or whether it would help prevent more incidents like Thursday's. And there is little sign the coalition is prepared to quit the stalemated war that has killed over 10,000 people, shattered Yemen's infrastructure and crippled its meager health-care system. War has only worsened the crisis in Yemen, which was the poorest country in the Middle East before it started. Since 2015, it has suffered from the largest cholera outbreak in human history, according to Save the Children. And last year, a prolonged Saudi-led blockade on humanitarian aid and vital imports into the country triggered famine. In the past 10 days alone, dozens of civilians have been killed in violence across the country, according to the U.N. Office for the Coordination of Humanitarian Affairs. Zvidzai Maburutse, Yemen Deputy Director of Programs at the International Rescue Committee (IRC), said one way to protect children would be to establish “safe spaces” where children can learn and get psychological help. “That way at least they don’t spend most of their time wandering around and would be learning and in protection,” Maburutse said, suggesting that these spaces be set up in pre-existing schools. But even then, Maburutse conceded that the IRC could not be entirely sure that the schools would be safe from airstrikes. “We are always hopeful and always advocating [for humanitarian law to be upheld], but they don’t seem to always distinguish between non-military and military sites,” he said. Stephens agreed that more needed to be done to highlight to the coalition the difference between civilian and military targets. “One way it could work is if the coordinates of these safe buildings were shared with the coalition,” he said, suggesting it could be organized through a U.N. body. Maburutse said the best long-term solution to protecting children would be the end of war along with an effort to distribute aid fairly throughout the country. “That would make sure Yemen people would be able to live in dignity,” he said. Baraa Shiban, a Yemeni activist who works for international human rights charity Reprieve, said the coalition airstrike hit far from any front line. So these sorts of sorties should end. “We have said it in the past: The coalition should stop all operations in cities and populated areas,” he posted in a series of tweets. “Today’s strike was reckless and should be strongly condemned,” he added. "It is time for a change."